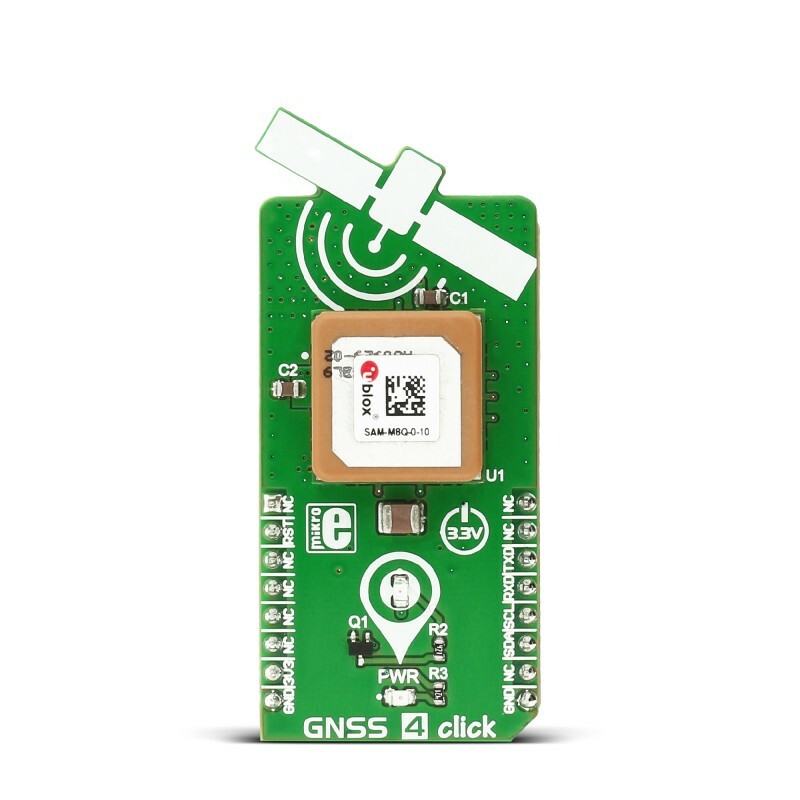 GNSS 4 click carries SAM-M8Q patch antenna module from u-blox. The click is designed to run on a 3.3V power supply. It communicates with the target microcontroller over I2C or UART interface. 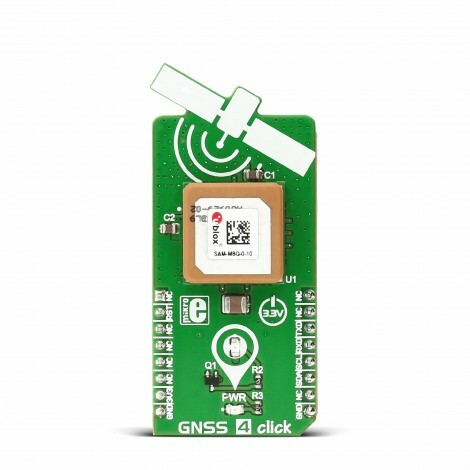 GNSS 4 click carries SAM-M8Q patch antenna module from u-blox. The click is designed to run on a 3.3V power supply. 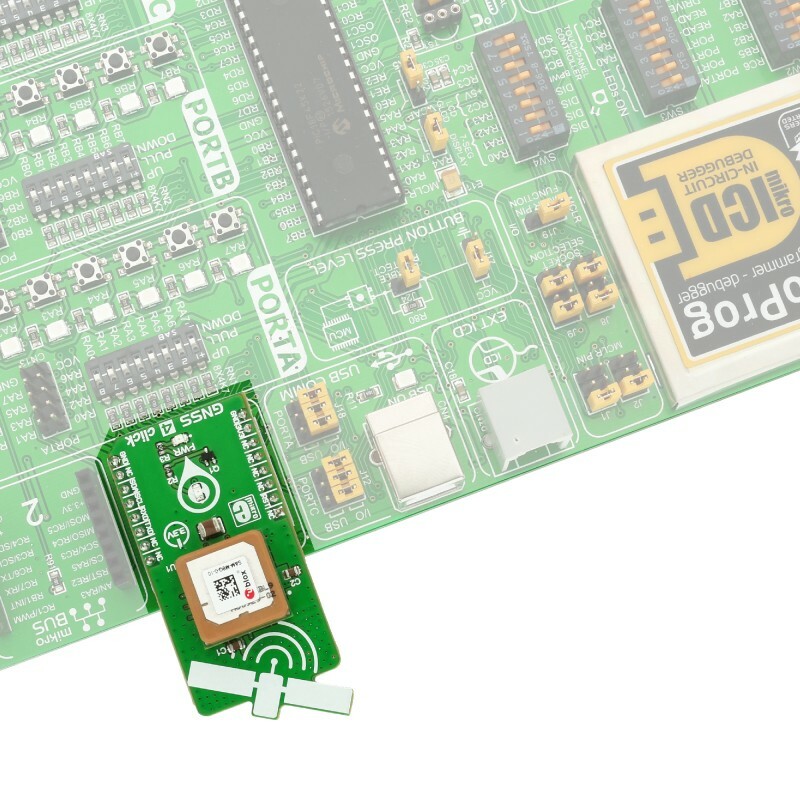 It communicates with the target microcontroller over I2C or UART interface. GNSS stands for Global Navigation Satellite System, an umbrella term that describes both the United States GPS, the Russian GLONASS global positioning systems and European Galileo. The SAM-M8Q module utilizes concurrent reception of up to three GNSS systems (GPS/Galileo and GLONASS), recognizes multiple constellations simultaneously and provides outstanding positioning accuracy in scenarios where urban canyon or weak signals are involved. The GNSS patch antenna is RHCP (right hand circular polarization) and has a peak gain of 3 dBic. The patch antenna is insensitive to surroundings and has high tolerance against frequency shifts. u-blox M8 technology offers a power-optimized architecture with built-in autonomous power saving functions to minimize power consumption at any given time. Furthermore, the receiver can be used in two operating modes: Continuous mode for best performance or Power Save Mode for optimized power consumption. Thanks to all these features the SAM-M8Q module is good in GNSS-hostile environments - indoor spaces, urban canyons (when a street is flanked by buildings on both sides), etc. The u-blox SAM-M8Q module can also benefit from the u-blox AssistNow assistance service. The Online service provides GNSS broadcast parameters, e.g. ephemeris, almanac plus time or rough position to reduce the receiver’s time to first fix significantly and improve acquisition sensitivity. The extended validity of AssistNow Offline data (up to 35 days) and AssistNow Autonomous data (up to 3 days) provide faster acquisition after a long off time. 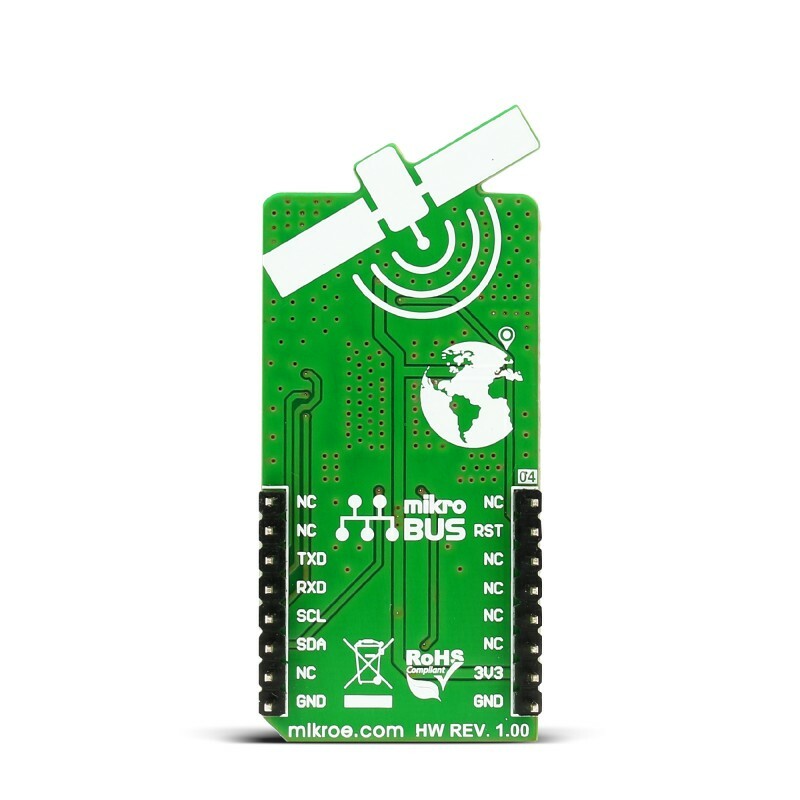 This table shows how the pinout on GNSS 4 click corresponds to the pinout on the mikroBUS™ socket (the latter shown in the two middle columns). Code examples for GNSS 4 click, written for MikroElektronika hardware and compilers are available on Libstock. 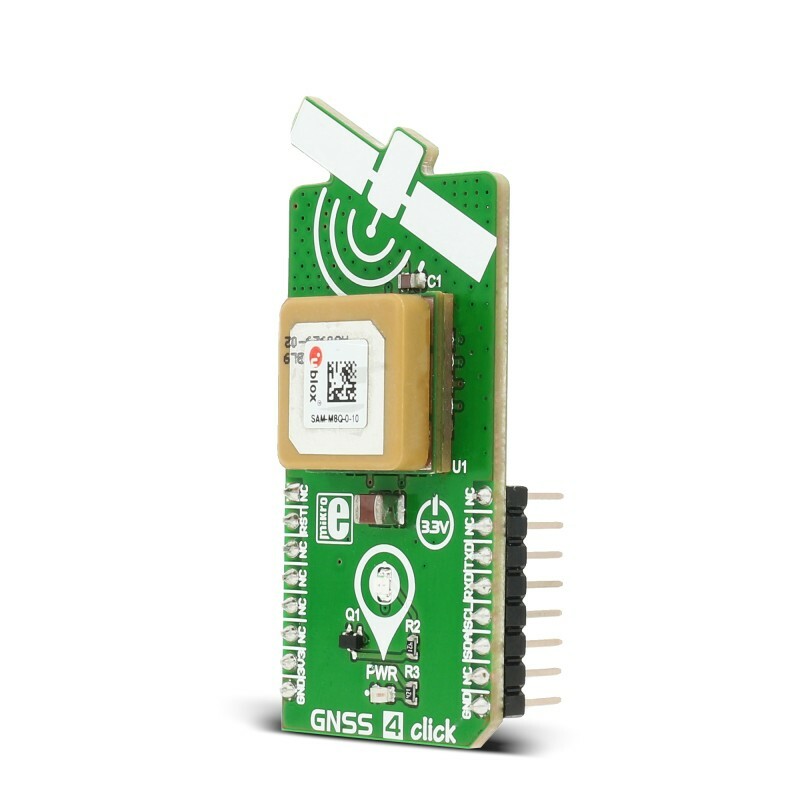 GNSS 4 library analyzes the NMEA messages sent by the module. All standard response messages are parsed, and the data is made available for use. The following code snippet shows the function that feeds the data into a buffer until the sentence is ready for parsing, and sets the appropriate flag when such event occurs.